The Big Move-Up Buyer Question: How Do You Buy and Sell at the Same Time? Our 5-part series is a “how-to” guide for moving up to your next home with as little stress as possible. Whether it’s your first time moving up or you’ve done it before, this series is a great resource. This time around, you’ve got more to think about, plan, and “get right” then when you bought your first home. It’s never simple when you’re ready to move on to a new home and you already own one to sell, or perhaps rent out. It’s overwhelming just thinking about what comes first, what to do when, how to pay for everything, and how to time it all so you don’t end up with two homes or no home. It’s both a logistical and financial dilemma! First, you’ve got to deal with keeping your current home clean for buyers; and second, you’ve got to deal with financing this new home purchase. All of this has to happen all at the same time. If neither is done properly, then your move isn’t going to happen. That’s why we’re here to help explain how to make this all happen, step by step. And help your stress levels decrease at the same time. Your decision on whether you will buy first or sell first, or even rent out your home, is a personal one. But you still need to call in the experts to help with making it. Just like you, every single move-up buyer has different finances, different families, different current homes, different stress levels, and different purchasing goals. All of this together is a whirlwind of factors that your lender and agent can help you sort out so you can make a decision AND then figure out what is financially possible with the direction you take. That’s what we are going to focus on today … the financial aspect of making the buy first or sell first decision. You need to talk with your lender to examine what are your financial options for this next purchase. determine how much cash you want to put towards that purchase. Let’s break down these two steps now. 1.) What do you want your monthly mortgage payment to be on your new home? As we always say, never ever start looking online at homes until you know what you want your new monthly payment to be. Most people can get approved for much more than they want to spend per month. To avoid this, you need to start with the end in mind. Ask yourself, “What do you want to write a check for every month for this new home?” Write that number down. A range is fine. Keep in mind that every $10,000 change to your purchase price only raises your monthly payment by about $50 per month, so a range to work within is actually better. 2.) How much cash do you want to put into your new home purchase? Perhaps you’ve been saving so you can have a bigger home without a bigger monthly payment. Or, maybe you want to save some of the equity from your current home for another purchase or updates in the new home. Think about your total cash outlay for this next home. Write that number down. Now write down where those funds are? Is all of it in your current home? It’s okay if it is. We just need to get it out before you can buy the new home, and selling your home first is not always the way to do that. Are funds elsewhere? Where? Are they liquid? We have some tricks of the trade to help you get cash out of your home without selling or even getting cash out of your brokerage accounts without having to sell those assets either. It’s a bit complicated, but we help clients do it all the time, so call us to learn more. For now, just write down how much cash you have in total, where it is, and how much you want to put toward your new home once everything is said and done. With this information, your next step is to talk to your lender about these two items—monthly payment on the new house and total cash outlay for the new house. Remember to start your conversation with your lender about monthly payments so you don’t get sidetracked with being approved for too much! From there, your lender will run an approval and will ask for bank statements, pull your credit and most importantly provide you with a loan summary sheet. This way you know what price you can be approved for on the new home. This number should be calculated by using your preferred monthly payment and the financial information given for the approval process. What amount are you approved for while keeping you current home? This is in case you want to buy a new home first before your current one sells (or maybe you can keep it as a rental, yahoo!). What amount are you approved for if you sold your home first? They will understand how to answer these questions for you. It all comes down to your debt-to-income ratio. Essentially, can they approve you to buy the next home you want before you sell or not? This can only be answered by your lender. You may want to buy first so you can take you time and find “the one,” but only your lender can tell you whether that’s possible. Now is the time to find this out. Once you have information from your lender, you may find out you will need to sell first before you buy. If that’s the case, stay tuned for next week’s article in this series. It will explain how to that step by step. You might need to rent back your old home or find a place to stay between homes if you don’t find another home immediately. That’s why you need to be a cordial seller so that the buyers of your home may be willing to let you rent back for a period of time. Once your home is sold, you have only a limited time to rent back or whatever. You may feel the pressure and could make a rash decision on your new home. Be aware of this! Another option is to have a “sale of home” contingency on the new home you are buying. Typically, the seller of your new home will look unfavorably on this contingency and may not accept it. If they do accept this contingency, they often will not be as negotiable on price or other terms. If your lender says you can buy before you sell, this is obviously preferable. You’ll learn exactly what you need to do when to make this happen in the final article of our series. This is usually the easiest and less cumbersome way to make it happen, but not everyone has the financial ability to be approved to buy first. There are several different ways to get cash out of your current home or other investments you have. We can explain your options and it’s easier than you might think. However, it does take a little time and planning, so this needs to start early in the process, WELL before you start looking at homes. There’s no pressure and no need to rush the search for a new home. Take your time and look around for perhaps your forever home. You don’t need to move anywhere once you buy a new home. You could even work or renovate your next home before you move into it. You will own two homes at once and could have double mortgage payments for a while, depending on when you sell your home. Your agent should be able to tell you how long this may take and what to expect timing-wise. You won’t know how much your current home will sell for and won’t know the equity you’ll get from the sale. This can make financing trickier, as the outcome is not 100% for better or worse. You run the risk of having a vacant home so plan to stage it so it looks appealing to buyers, which can come at an extra cost. Maybe you can’t see giving up your first home because it’s in a great location where renters would cover your mortgage. Or you need to relocate but hope to move back to this area in a few years. Then you may want to consider renting out your home. You can learn more about that topic from our How to Be a Landlord Series. However, if renting out your home will impede on your ability to buy your next home, then definitely sell. No question at all! Work with your lender and your agent to know which option is best for you financially – buy first, sell first or rent out. You must make a definitive decision before starting to look at homes so you can get all of the financial pieces in order first. Keep in mind that the time of the year may also play a part in which is decision is best for you and the location of your home. You don’t want to be looking for a home or selling your home during the holidays if you can help it, for example. 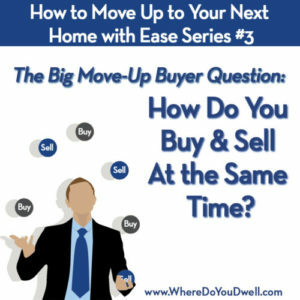 We’ll run through all the steps with each option in Week 4 and Week 5 of our How to Move Up to Your Next Home with Ease series.